Definition: A Vertical Marketing system (VMS) comprises of the main distribution channel partners- the producer, the wholesaler and the retailer who work together as a unified group to serve the customer needs. In conventional marketing system, the producer, wholesaler and the retailer worked separately with the intention to maximize their profits even at the expense of one another. This led to the unending conflicts between the channel partners resulting in less profits for the business as a whole. In order to overcome these conflicts, several firms have started using a vertical marketing system wherein producers, wholesalers and retailers have joined hands with each other and are working in unison towards the accomplishment of the business objective as a whole. This has led to the increased profits for each involved in the channel of distribution. Corporate Vertical Marketing System– In Corporate VMS, one member of the distribution channel be it a producer, a wholesaler or a retailer Owns all the other Members of the Channel, thereby having all the elements of production and distribution channel under a single ownership.For example,: Amway is an American cosmetic company, which manufactures its own product range and sell these products only through its authorized Amway stores. Here the ownership of production and distribution is with the company itself. Contractual Vertical Marketing System– In Contractual VMS, every member in the distribution channel works independently and integrate their activities on a Contractual Basis to earn more profits that are earned when working in isolation. The most common form of Contractual VMS is Franchising. In franchising, the producer authorizes the distributor to sell its product under the producer’s name against some annual license fee. For example, Mc-Donalds, Dominos, Pizza Hut, etc. are all forms of the franchise which are working on a contractual basis. 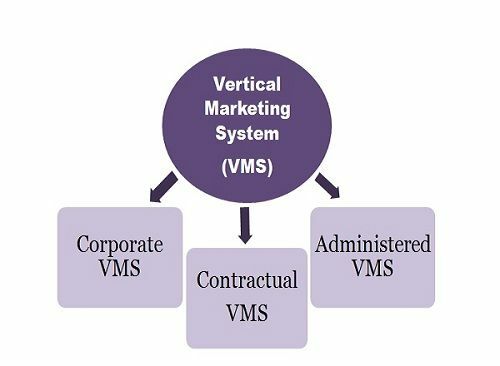 Administered Vertical Marketing System– Under Administered VMS, there is no contract between the members of production & distribution channel but their activities do get influenced by the Size and Power of any one of the member. In simple words, any powerful and influential member of the channel dominate the activities of other channel members. For example, Big brands like HUL, ITC, Procter& Gamble, etc. command a high level of cooperation from the retailers in terms of display, shelf space, pricing policies, and promotional schemes. Thus, through a vertical marketing system, the channel partners establishes a close contact with each other and work in unison towards the accomplishment of common objectives thereby enjoying more profits which they would have been earning when working alone.